We’ve seen NBC roll out plenty of premium direct-to-consumer subscription services, from Premier League Pass to Track and Field Pass to PGA Tour Live to GOLFPASS. Now, they’re bringing that approach to IndyCar, but for practices, qualifying sessions, replays and other shoulder programming, not live races. NBC announced Thursday that they’re launching IndyCar Pass, which will have over 200 hours of programming (including 50 hours around the Indianapolis 500 in May). NBC Sports Gold — NBC Sports Group’s direct-to-consumer live streaming product — launched “INDYCAR Pass“ today, providing fans in the U.S. with one convenient location to watch live coverage of all NTT IndyCar Series qualifying and practice sessions, and Indy Lights presented by Cooper Tires races, plus full-event replays of all NTT IndyCar Series races, and 15-30 minute race cutdowns of both series. “INDYCAR Pass” will provide 200+ hours of programming, including 50+ hours of coverage surrounding the Indianapolis 500 presented by Gainbridge. It is available now until March 10 for an early-bird price of $49.99. The regular price is $54.99. It’s interesting that NBC is promising to bring “television-quality production” to the qualifying and practice sessions, and that may be the main selling point for this. However, not all fans are going to be happy about many of these sessions moving to a premium subscription product “on an exclusive basis,” as a lot of this content was previously available on YouTube or Periscope broadcasts for free (albeit with lower production quality). And this won’t be a solution for those who want to watch live races, as they’ll still need access to NBC and or NBCSN. But that fits in with the larger trend of NBC putting some of a sport’s content on a premium over-the-top service while still keeping some of it for TV; that’s been seen across other sports, especially with the Premier League. What’s interesting with this is that most of the other NBC Sports Gold premium packages involve live events, though; it’s different to see one like this focused on replays, practices and shoulder programming. 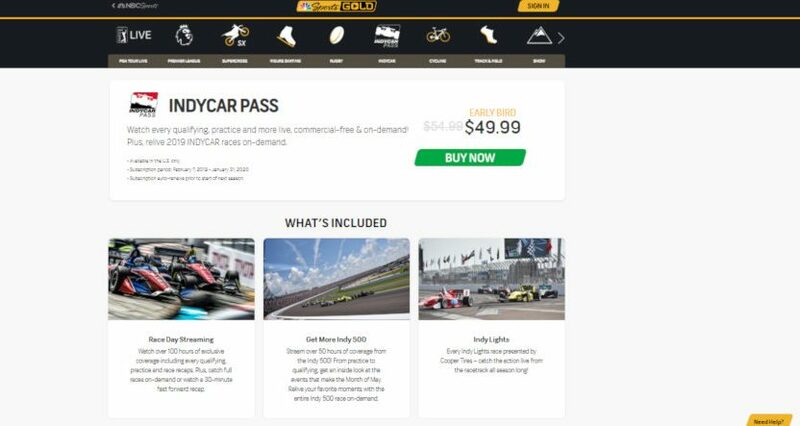 For those who are fervent IndyCar fans and can afford to pay $50 for extra content around the sport, this may come as a welcome move. It’s putting all of this stuff in one place, and offering higher production values for qualifying and practice session broadcasts. This definitely isn’t an over-the-top solution for those who want to watch races live (it could be fine if people are fine with replays only), and it’s likely going to be a potential addition rather than a cable replacement for most of the target audience. And we’ll see just how many people are willing to pay extra for content that doesn’t include the races.